…you know the fella. He was always my favourite. He transformed into a tape player. Why would the Decepticons need that? In case – whilst attempting to destroy the Autobots/the Earth/anyone getting in the way of their general evil shenanigans – they fancied throwing on a bit of Maxi Priest to soundtrack their malevolent wrong-doings? Is there an equivalent in the animated-robofolks-from-Cybertron’s cartoon antics today? Does he download MP3’s in an evil fashion (p’raps dodgy copies?) and fling them at Optimus and co? Would being slapped in the face with an MP3 hurt? Am I talking too much about Transformers? So…the very tenuous link here is that, we’ve been played on the radio a bit. Which is nice (did Soundwave have an FM tuner built in…? Sorry.) You can hear some of these shows again via the wonders of the internettings. I believe Amazing Radio are playing us again on Aaron Phillips Rock Show this Saturday from 8pm too so if you’re not out covered in bunting, gin and tea for the Jubilee then try and tune in eh? Speaking of the Jubilee – we’re headlining the 2nd Stage at this – http://www.victoriousvintage.co.uk/ on Sunday night. It’s free and, if you don’t fancy the chirpyness of The Lightning Seeds, we’ll be sending out our misery-pop and Transformer-based anecdotes at 9.30pm. Go on the Saturday night too cos our Elliott’s other band will be making a gentle racket. And they’re up against Dodgy. Nuff said. Have a good weekend Ma’am. Elliott asked me to get the word ‘belabor’ into this post…. A warm and friendly handshake and hug to you all on this marvellous day in May. Camp Bang (I think I have that DVD somewhere…mail order only…) is once again brimming feverishly with excitement – I don’t want to belabor on at you all but OUR ALBUM IS FINISHED, HONESTLY GUV….we just want to get it sounding as good as we possibly can, and, when you’ve laboured on something for as long/intensely/lovingly/loathingly/obsessively as we have, a month or so more to get it sounding, what I believe ‘da kidz’ call, ‘phat’ is small change really. SO HERE IS A SNEAK PREVIEW OF A COUPLA TRACKS – HOPE YOU LIKE THEM. Our next gig is headlining the second stage at The Victorious Vintage Festival, Portsmouth Dockyard on Sunday 3rd June. Jubilee weekend innit and it’s free too so a lovely time should be had by all. We’re playing at the same time as The Lightning Seeds but fortunately no-one’s likely to have heard of them so you’ll all be watching us eh? Good. 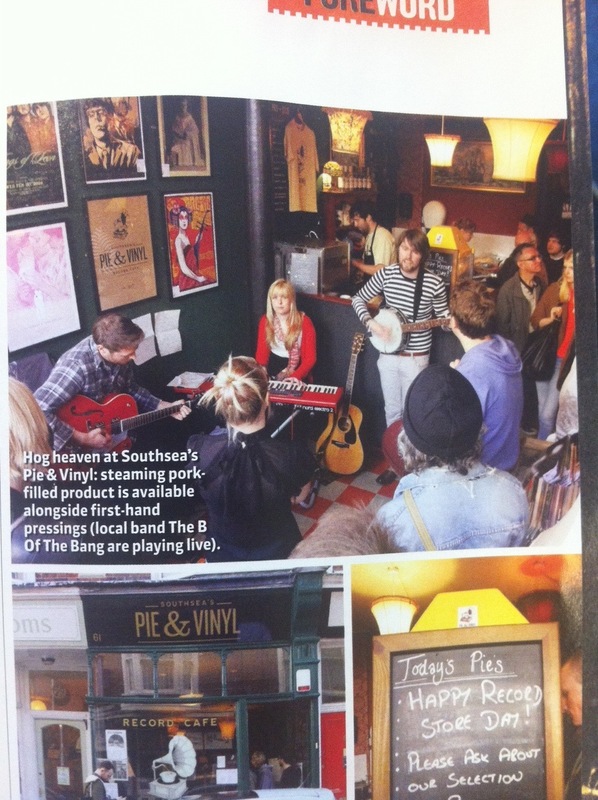 Here’s a piccie of our recent Record Store Day unplugged set at our very favourite place in all the land. Pie and Vinyl. They only sell….well…you’ve probably guessed but as they are two of my very favourite things it really is a heavenly establishment. The Word magazine came down and did a little piece – I recommend you all go and see them as the guys who run it are genuine, lovely and knowledgable. What are you waiting for?